A Cabra mother is running for Council this May in an effort to battle the illegal parking on footpaths across the capital, after setting up a Twitter account calling out those who park recklessly. Neasa Hourigan is mum and full-time carer to her six-year-old daughter Edith, who is visually impaired and uses a cane. She set up the Dublin Blockers account on Twitter last year, in an effort to raise awareness of how badly footpaths across the city are managed, and to focus on the concept that pavements are for people, not cars, bins, or other obstacles. In this May’s elections, Neasa plans to contest in the council elections for the Green Party because of this issue, and to continue raising awareness. Speaking to Dublin Gazette, Neasa said that the blocked footpaths may seem like something small but can have a huge impact on the lives of those with visual impairments like Edith, or those less able or in wheelchairs. She said: “We’re not even a five-minute walk to Edith’s school, but in that five minutes we usually encounter two or three big obstacles, and those are usually bins or parked cars. She has to learn how to use the cane, and part of that is confidence. “I’m not anti-car – I have a car. It’s not the two wheels on the pavement that bothers me, it’s the space left. If you can stand beside the car and put your arm out, that means there’s room for someone with a pram, someone with a cane, someone in a wheelchair. However, most people usually only leave about half a meter. “A car might park nicely one day, then completely block the path the next day, or a car could be parked in the driveway and another is parked blocking the road, which could edge those in wheelchairs or with a cane out onto the road. In response to a query from Dublin Gazette, Dublin City Council said: “This type of inconsiderate motorist behaviour is an on-going issue for Dublin City Council and its Parking enforcement service. “The City Council’s Parking Enforcement agents do enforce illegal parking on footpaths when observed or reported. The level of enforcement depends on the level of obstruction, in most cases either the offending vehicle is clamped or removed. “It is the City Council’s intention to focus more on this type of illegal parking as the levels of noncompliance with the law, in this regard, appears to be on the increase. 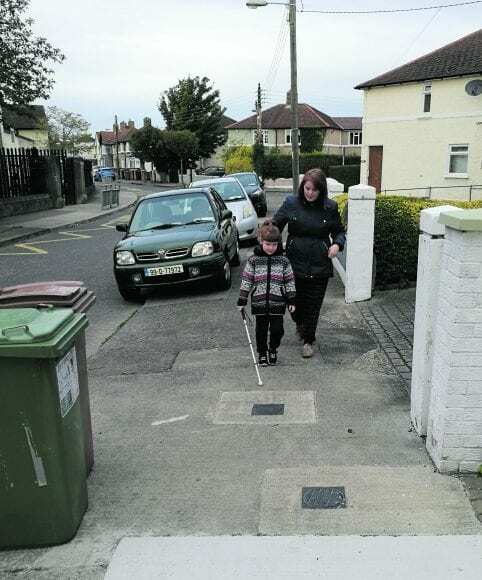 Dublin Blockers is just one of a number of accounts that has been set up recently in an attempt to raise awareness of just how damaging blocked paths can be to those less able. Sean O’Kelly is behind the ‘A Day in My Wheels’ campaign, and says he sees the blocking of paths frequently around the South Dublin area. Sean said: “Before, I was trundling along in a wheelchair and there was a car completely blocking the footpath and I was so lucky that there was a traffic warden nearby. He had to help me navigate around the car, and I had to actually go out onto the road to get around the car. In a statement, An Garda Siochana said that parking on a footpath is illegal, and is usually punishable with a parking ticket. They said: “Gardaí would ask anyone affected to report the matter to their local Garda Station. A spokesperson for Dun Laoghaire Rathdown County Council re-iterated that parking on pavements is illegal, with a €40 fine applicable to the offence of parking a vehicle on a footway, but that it is not possible to allocate resources to provide coverage ‘at all times in all areas throughout the county’. DLRCC said: “Unfortunately, some inconsiderate drivers put other people at risk by parking on footpaths, particularly people who are wheelchair users, people with visual impairments, as well as the elderly and parents with buggies.